THE MIDWAY: COMING TO A NEIGHBORHOOD NEAR YOU! Cleveland’s Midway Protected Bike Boulevard network will be the most extensive bike network of its kind, anywhere! 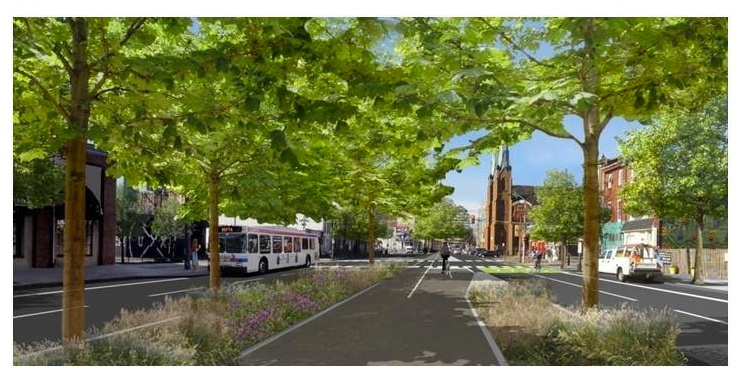 While buffered bike lanes have been installed elsewhere both in this country and internationally, The Midway will consist of 60 miles of landscape-buffered, two-directional center lane bike lanes–with separate bike signal system–which will connect Cleveland neighborhoods to each other and to key regional assets. When complete, The Midway will be a truly world-class cycling network designed for Clevelanders of all ages and bike skill levels. Over the past 5 years, cycling as a mode of transportation in our city has become increasingly important. In fact, based on American Communities Survey estimates from 2016, Cleveland’s bicycle commute rate now stands at 1.2%, more than 4 times that of the state of Ohio, which stands at .3%. With the Midway’s network of 60+ miles of stress-free bike facilities, not only will bike commuting continue to grow but also recreational riding as well. The Midway was studied by the Cleveland City Planning Commission in 2016 as part of NOACA’s TLCI Program. The plan builds on preliminary work of Bike Cleveland and the YMCA, and studied the technical feasibility, programming, and strategic implementation of dedicated cycle tracks and protected bike facilities within the City of Cleveland. You can view the public meeting presentation HERE. This plan makes the Midway an official plan of the City of Cleveland. Designed with safety, convenience and comfort in mind, The Midway will be an easy to navigate network connecting city residents of all ages to schools, places of employment, and regional assets like Cleveland Metroparks. Planned to first roll out in Cleveland proper, The Midway network can easily expand to surrounding suburbs. In fact, the East Side Greenway plan recommends Midway-style facilities on a number of former street car corridors included within that plan. When built, the Midway’s world-class, human-scale infrastructure will distinguish Cleveland as one of the most bike-friendly and livable cities in the country. Cleveland is fortunate to have the space needed to create such a transformative, bicycle network as The Midway, a legacy of both our city’s former streetcar era and decades of suburban sprawl. Today, Cleveland boasts wide street corridors with low traffic volumes, which presents a ready opportunity for Cleveland residents and visitors alike to embrace active transportation within a safe and inviting riding environment. From 1860 until 1954, Cleveland residents of all ages relied on the city’s 236-mile streetcar network to get to work, school, a ballgame and even the outlying Metroparks. At its peak in 1946, a record 493 million passengers rode the streetcars. When they were removed in the mid-1950’s, however, these former street car corridors were simply converted to additional vehicle lanes. What is especially innovative about The Midway is its adaptive re-use of infrastructure formerly dedicated to public mass transit use. No city in the world has proposed such a project. We see the completed Midway injecting the vibrancy of the street car era within city neighborhoods once again. BUT WHY BUILD IT IN THE MIDDLE OF THE STREET? WHERE WILL THE MIDWAY PROJECT BEGIN? The first segment of the Midway network, referred to as the “proof of concept corridor,” will run along Superior Avenue, from the east side of Public Square to East 55th Street. An $ 8.3 million Congestion Mitigation and Air Quality (CMAQ) grant from the Ohio Department of Transportation was announced by the NOACA Board of Trustees on 12/8/17. This grant represents over 50% of the funding needed for the Superior Midway segment, with discussions underway with additional prospective funders. The “proof of concept network,” according to the city’s Midway planning study, will extend north on East 55th to the lake and out St. Clair Avenue to Martin Luther King, Jr. Boulevard. Preliminary funding discussions have begun for this component of the overall Midway network. Physically buffered bike facilities are safer for cyclists, pedestrians, transit riders and even for motorists themselves, improving both riding and driving behaviors. ﻿﻿ WHAT CAN I DO TO HELP? The Midway is a bold, transformative vision for the city of Cleveland which will take an “all hands on deck” approach to complete. Many public officials do not understand that protected bike infrastructure is what people, both bicyclists and not-yet-bicyclists, want. The Midway can become that quality of life standard which will make Cleveland more competitive for recruiting and retaining young residents. What are the best ways to promote The Midway? Harnessing the power of social media is key. Tweet #IwanttheMidway! Share project updates on Facebook and Instagram. Talk the project up among your family and friends. It is important to remember to respect those who don’t yet see why a project of this scope is important. Some fellow citizens still react to bike lanes as a personal affront, while others see bike infrastructure as intended for persons riding through their neighborhood rather than living in it. Respectful dialogue is essential if we, as a community, are to be a strong, collective voice for action on this plan. 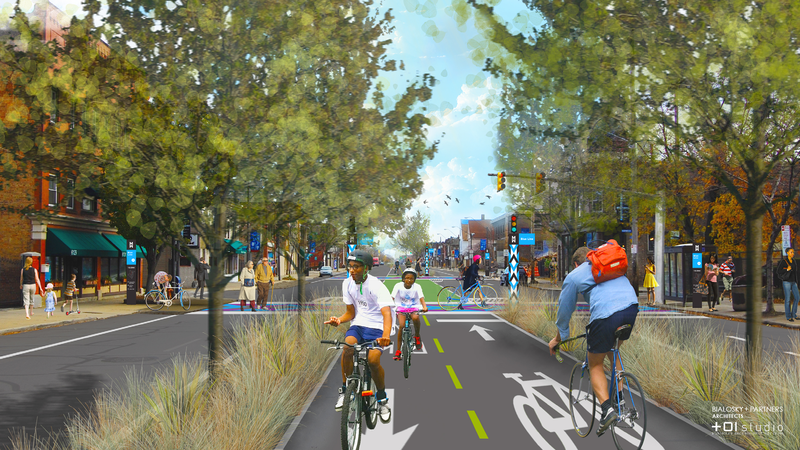 Contributions to Bike Cleveland will also help to advance The Midway Bike Boulevard Network. Together we can create a city which comfortably accommodates all cyclists, ages 8 to 80.